This dress is simple but elegant. Lovely for a little evening dinner and can also be used for a simple outing. It fit great, I'm curvy and this dress hugged every where perfectly without showing too much. This dress is very thick and will NOT show your undergarments. The colours are lovely and rich. I will be buying more. If you are looking for high quality, multifunctional and comfy fitted dress to impress. This dress fit perfectly! The inside lining is extremely soft and it's a very thick material, so it's not see through at all. Very high quality, not joking! I'm sure I'll be able to wear this dress over and over again. I ordered a 2X, one size up. It fits but it's not snug. So, order your true size! The material is perfect.Is very great I loves this dress size fit and color look style thank you seller. This is the best bodycon dress I've ever bought. I bought the Medium, fits perfect. The color is gorgeous and the material is so soft. I'm 5'4" and it hits me at about 10 inches above the knee. Bought this dress to wear to my best friends bridal shower. I got many compliments on it. I’m a size 14 and i got an XL and it was fitted so if you’re looking for a looser fit i would definitely go a size up. Absolutely love this dress.Just like the picture. This dress worked perfectly!nice dress.it doesn't look too serious because of the color block. Very stretchy material making every movement very comfortable. 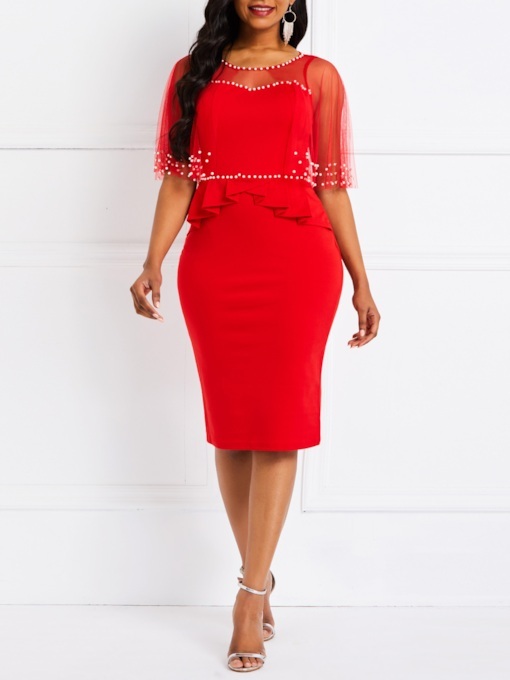 It fits great, great material, nice.I really love this dress.It is a great dress for the price.It looks so classy and cute and I was pleasantly surprised by the quality. It’s nice for the price.It doesn’t look cheap. The fabric is nice and will be a super easy to wear dress for work or just casually running errands. Looking forward to getting the new one. I love the dress. Comfortable. It looks classy and great for the price. Buy it, you wont regret it.I liked it so much and think the price is very good for this quality dress. looks really like the pictures.